This is what we usually call “basic information” about Christianity and the doctrines Jesus taught. In the days of Noah people were going about their daily routines, conducting business and ignoring the preaching of Noah. They did not understand. Paul describes this willful ignorance another way in Romans 21:1 For even though they knew God, they did not honor Him as God or give thanks, but they became futile in their speculations, and their foolish heart was darkened. Until the flood came and took them all away… This ignorance and self deception means that the judgment will be completely unexpected. Jewish tradition is not the inspired Word of God. It is not infallible. However there are traditions which say that Noah was not an ineffective preacher; that many repented and turned to the Lord. There are two clear statements we must put together. From Josephus, Noah “was afraid they would kill him, together with his wife and children, and those they had married” together with the book of Jasher “all the sons of men who knew the Lord, died in that year before the Lord brought” the flood on the earth. That is, every single man and woman who trusted the Lord either died a natural death (highly unlikely) the year before the flood, or, more likely, in keeping with Jewish traditions, every single man and woman who trusted the Lord through Noah’s preaching was martyred before the flood came on the earth. If this is true, and I believe that it is, then the coming of the Son of Man will be just like the days of Noah means that the mockers and blasphemers of this world will murder any and all persons who dare to follow the Son of Man. Hubby is working on the Conflict of the Ages Part 3: “They Deliberately Forgot” –The Flood and the Ice Age. Yes, this series has pretty cumbersome titles, doesn’t it? The first part is based on 2 Peter 3:5, where Peter nails the whole secularist amnesia and its resulting erroneous dogma. In this work-in-progress, he quotes from a site called Talk Origins, where Secularists prepare their minions to go forth and do battle with nasty Creationists. That’s not the way they put it, of course. They claim to be objective educators simply trying to teach truth and prevent lies from invading impressionable minds. Uniformitarians are the truth-tellers, of course, and Creationists are the liars. In our book, we are talking about science and history related to the flood and the ice age. You don’t really need to understand radiohalos to get the point of this blog post, but here’s a brief explanation. They are tiny colored spherical shells in rocks caused by alpha particle decay of radioactive isotopes, usually uranium, found primarily in biotite crystals within pieces of granite. These can be evidence of the age of the sample. is classic secularist strategy. Here are the steps in their process of discrediting Creation Science. Very near the beginning is the usual dogmatic assertion quoted above. Plutonic Volcanic rocks are millions of years old, because they form deep in the earth and that’s how long it must take them to harden. No evidence. No proof. Just the minions gathering around with open mouths and adoring eyes at this “truth” that needs no proof. The Talk Origins Radiohalos article mentions “Gentry’s Thesis” as if this scientist were the only originator and exclusive propagator of the theory they want to discredit. The work they seek to refute has been a scientific position since at least 1918 and represents the work of many scientists past and present. There is no “Gentry Thesis”, but this artificial man and this misrepresented theory are easy to attack and discredit. They also mention the “Polonium Halo Hypothesis”, which is also a fake construct, because Polonium radiohalo information is not a theory. It is a tested and long-proven fact. This all reminds me of the “Two Legs Bad, Four Legs Good” mantra of the sheep in George Orwell’s Animal Farm. Talk Origins asserts that because lots of people who worked a long time on lots of rocks disagree with that imaginary single man mentioned above, he can’t possibly be right. The Talk Origins article contains the assertion that Gentry was never properly qualified to speak on radiohalos in rock samples because he wasn’t a geologist, he was a physicist. How a physicist is not qualified to talk about radiohalos is anybody’s guess. But this secularist “teaching moment” is essential to convince the uninitiated that the high priest is the only one qualified to dispel the ignorance of the masses on their religious beliefs. Any creationist can be immediately dismissed as a reliable source if the secularist asserts he doesn’t have the proper qualifications to speak on the subject they want to discredit him about..
Hubby got into a fb message conversation with a person who adopted the position that he had never worked in the sciences and was therefore not qualified to speak in the discussion groups where he participates. The truth is that he has postgraduate coursework, has taught science, and is perfectly qualified. But his comments are dismissed because he isn’t a member of the secularist high priesthood. “Go away, little man. I’ve tried to be nice, but you won’t listen. Your words are of no importance.” Well, no, he’s not going away. The minions need to hear the truth with proof. Anyone who says that God is a big bully is picking and choosing what he reads in the Bible. Read the whole thing, cover to cover, over and over, to see the whole God. Yes, it’s hard work. Yes, you’ll see violence and misery and pain and suffering, but look at what else you’’ll see! In that day the Lord will whistle for the fly that is in the remotest part of the rivers of Egypt and for the bee that is in the land of Assyria. They will all come and settle on the steep ravines, on the ledges of the cliffs, on all the thorn bushes and on all the watering places. Now in that day a man may keep alive a heifer and a pair of sheep; 22 and because of the abundance of the milk produced he will eat curds, for everyone that is left within the land will eat curds and honey. God promised judgment on Israel for sin. Over and over He sent prophets, humbled kings, removed evil influences, but the people continued to sin. So here in this passage in Isaiah God says invaders will come and a large portion of the land will be ruined. In other verses he talks about burning, about thorns choking the land, but here he talks about the bees that will settle everywhere. Rudyard Kipling describes swarms of bees that live in cliffs in his Jungle Books. They are deadly, terrifying. Normally everyone keeps away from them. But look at what the remnant of God’s people can do! There might be destruction, burning, judgment. There might be so many thorns that they can only keep a few head of livestock. But those bees, those terrifying stinging killers God sent as part of the judgment? The people can get honey from them. That’s how God is. He punishes the sin, but He loves the sinner. He judges wickedness, but he shows mercy and comfort. He sends enemies, trouble, and pain to the disobedient, but his heart grieves over the desolation and anguish and He sends curds and honey in the midst of the thorns and the burning. This is a parallel passage to Matthew 23, where Jesus speaks about the coming judgment. Both passages talk about the judgment and what the Messiah will do. Here it is again – the love and the judgment. God isn’t a bully. Man is a fool, fighting the outstretched hand of help, spitting in the face of the Messiah. But from the bees that drive in the enemy and cause desolation, he still gives us the honey. 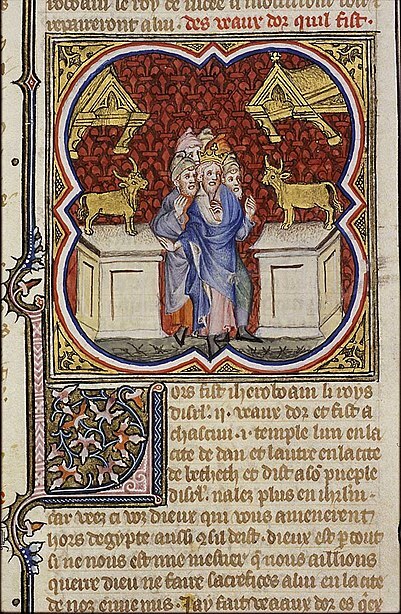 Our last post stated that throughout the United States, churches are worshiping golden calves. It is much easier to point out what we are doing wrong than what we should be doing. What is true and proper worship? Since this question has been asked and answered repeatedly for nearly 2,000 years, there are many and detailed answers. Since most modern Americans do not like the answers, you might not have heard these before. The church began in the Temple built by Herod, also known as the second temple. While the vision of Peter and the Jerusalem Council recorded in Acts 15 both clearly point out that Gentile believers are not under the whole law, Christians followed Jewish synagogue rituals. These rituals included men separated from women and children during the service, daily services, Sabbath services lasting from sundown Friday until sundown Saturday, almsgiving to the poor separate from the synagogue, antiphonal singing, that is one group singing a phrase which was then repeated by another group, lengthy Scripture reading (the Old Testament), woman wearing garments where only their faces, hands and feet were visible, special services which lasted five hours, tithes which were obligatory and had to be paid. Some of these practices had little to do with the biblical Law of Moses, and the Spirit of God clearly grants us freedom. But our freedom is not to do whatever we want. God grants us the freedom to worship God in the manner which bring Him the greatest possible glory. So Paul teaches us in this chapter that as believers, we are to come together to pray, publicly read God’s Word, teach doctrine, baptize and celebrate the Lord’s Supper. There are several disagreements over the Lord’s Supper and baptism but these disagreements are well over a thousand years old. The disagreements over the Lord’s Supper and baptism are part of the traditions of the church and this blog will not have any affect on any of those different beliefs. What day we should come together has only been an issue for the last 2-300 years, yet this issue, like baptism and the Lord’s Supper and are fixed in most believer’s minds and this blog will not matter on the issue of what day we should come together to worship. The church which claims to represent Jesus Christ in the United States of America must do several things to regain the power of God. She must return to a life of holiness and purity, return to teaching the Word of God and forsake the standards of this world in public worship. These are interlinked, interconnected. We will find that attempting partial obedience will not fill our churches with the power of God. The word repentance means to turn from our own course, our own thoughts and our own actions and turn to God’s instructions, plans, desires. Once we do that, the average Christian in the United States will find that he has sold himself into slavery. The first step of repentance is get out of debt. The Secular Humanist plan to get out of debt is to increase income. While an increase in income can help some people get out of debt, for many people attempting to get out of debt by increasing income is either not possible or is simply destructive. The pursuit of wealth can destroy health, spiritual life, relationships and rarely produces the wealth you are seeking. The correct course of action is to trust in the Lord and reduce expenses. While this sounds contradictory, it is God’s plan. Some people do need to change occupations to properly serve the Lord, but many find that they need to fundamentally change the way they live. Debt slavery has destroyed churches as well as individuals and families. Organizations such as churches and schools who obligate themselves through debt are pressured to do whatever is necessary to keep people attending to keep money flowing to keep paying the debt obligations. Often (usually) this means failing to take proper disciplinary action, failure to preach against certain sins or promoting “popular” speakers, programs, organizations, etc. just to keep from losing money. First and foremost organizations which call themselves “churches” must return to preaching the Word of God. The cry I heard growing up was how can a few hours of the Word of God taught in church each week compete with the Secular Humanist indoctrination of all day every day in schools, TV, movies, etc. While that was a very legitimate concern, the answer of the American church was to give up and invite Secular Humanism into the church. Programs such as AWANA, Bible Memory Association, Navigators, and Teen Challenge which teach Bible Memory used to be far more prominent in churches. Bible memorization is commanded in the Word of God. Throughout the Word of God the emphasis is on personal holiness. God also expects us to give Him our best. While the doors of every church should be open to unbelievers to “come as you are” believers in most churches dress and act like the world. Why are we surprised when young women dress like harlots when they are simply copying the dress of their parents? While the Bible does not give a detailed definition of modesty, that subject is rarely mentioned in modern American pulpits. Our language needs to be not only pure and wholesome, but encouraging and uplifting. Let your speech be alway with grace, seasoned with salt, that ye may know how ye ought to answer every man. Colossians 4:6 The individual believer must also be knowledgeable, always ready to give an answer of hope that lies within us. After all these things, the real dividing line still comes down to music. It was said of the American church for over 200 years that Christians had their Bibles in one hand and their hymnbooks in the other. Many unbelievers were more afraid of the hymnbooks than the Bible, because the words of the American hymns taught the words of the Bible in a way that was easy to understand. TV advertising copied the style of Gospel songs because they made an impression and the concepts were easily memorized. Paul commanded both the Colossians and the Ephesians to be speaking to yourselves in psalms and hymns and spiritual songs, singing and making melody in your heart to the Lord. The question the Anabaptists, Mennonites, Lutherans, Reformers and church of England all asked 500 years ago was how this was to be obeyed. They had no electronic recordings, electronic instruments or electronic amplification. Otherwise, they were not so different from us. The first conclusion they all agreed to was that the music must glorify and teach the Word of God. While “teaching the Word of God” means different things to different people, there was quite a concern over instrumental music without any words. Since the first recorded church manual in the 2nd Century AD, how much music should there be in a service and how should it be divided between congregational and “professional musicians,” that is soloists, musical groups and instruments. They drew some nearly universal conclusions. There is room for great variety in our freedom in Christ and this allows for occasional exceptions to each of the following guidelines. Congregational singing should be predominate. Most of the music should be as simple as possible, so as many people as possible will understand the words. The words are the most important part of music and they should reinforce the teachings of the Word of God. Whenever possible, they should reinforce the teachings of that sermon. There should be a balance between, psalms, hymns and spiritual songs. This means that the majority of music in any given service will be older traditional music because the church is two thousand years old. The style of music must not bring the world into the church. The only serious conflicts are the last two points. If you simply do not like any form of traditional music, then the question is why? Traditional music can mean no instruments at all, country/western style, “hillbilly” or southern gospel style, orchestral, piano and organ, a single guitar, an electronic keyboard, chanting and bells. Are you unable to tolerate any of these? The last point, “must not bring the world into the church”, centers around volume and rhythmic beat. Electronic amplification is used by the world to overwhelm make people accept a message they often do not even understand. It is often called sensory overload. While much about music is subjective and many techniques depend on how they are used, the concept of getting a message across by overwhelming people through volume is sin. God wants us to love Him emotionally, but where does the Word of God give us permission to bypass our rational nature and allow our emotions to overwhelm us? Yes, that happens sometimes as part of life, but to create an environment to overwhelm an audience using volume every service, several times a service? The addition of flashing lights, vibrations and scented smoke adds to the sensory overload. When used by secular musicians, they openly claim that their techniques are designed to break down sexual inhibitions and cause an emotional acceptance of whatever message the musician wants. How do these techniques Glorify God? Through the blessing of Facebook we were able to locate and fellowship with two sets of friends in the Kansas City, MO area, We also met and talked with some Facebook friends we have never met in person in the Denver, CO area. One issue that has come up repeatedly this year, and also came up several times within the last week, is the state or condition of Christianity in America. I believe that the church in America, as a whole, is worshiping the golden calf instead of the Lamb of God. When we think of the golden calf, we usually think of the one Aaron made while Moses was on Mount Sinai. Moses destroyed that one immediately after it was made, but the two golden calves of Jeroboam I existed until the Northern Kingdom was taken into captivity by the Assyrians. Our daughter graciously obtained for us tickets for a Voice of the Martyrs conference in Tulsa, OK. We were grateful for the opportunity and also attended the services of the host church the next day. The Sunday School lesson was on children honoring their parents. The question we spent the entire time on was, at what point does this honoring stop? Most members of the class were our age and in our position; having elderly parents who needed to be cared for and adult children raising their own families. Many good points were made and we were thankful for the lesson. But the Pastor’s sermon was, at least in our minds, just the opposite. He used Psalm 33 as a text and emphasized music being loud. He said that teenagers today would only sing and listen to CCM. (By the way, how is a style that is over 50 years old “contemporary?”) But the important point, in our minds, was the insistence on changing the worship service to give the least mature people in the church, the youth group, the authority to dictate the type of worship. The congregational singing, except for 2 verses of “How Great Thou Art”, was both difficult to sing and unfamiliar. From the number of mistakes the choir made, it seemed to be too difficult or perhaps unfamiliar to them also. Part of that desire to “reach more people” is a true, genuine love that longs to reach the lost with the Gospel of Jesus Christ. But part of that desire is to pay bills when the church is not making its budget. Has your church reached the point where you have enough people to pay the bills but have abandoned a clear presentation of the Word of God? Before he made these golden calves, Jeroboam I took counsel. “And the king took counsel, and made two calves of gold..” Do we not hear that before anyone commits a great sin and rebels against the Lord that he “takes counsel?” Sometimes it might be a proclamation of a fast, as Jezebel did before producing false witnesses to destroy Nabal and get his vineyard for King Ahab. Sometimes it might be an annual denominational conference, but rarely do people rebel against the Lord without some kind of support from others. Korah, Dathan, and Abiram were supported by 250 other Israelites when they opposed Moses. First, Jeroboam I lied. “It is too much for you to go up to Jerusalem. Behold your gods, O, Israel, who brought you up out of the land of Egypt!” Decades earlier, when Solomon turned from the Lord, God prophesied to Jeroboam I through the prophet Ahijah from Shiloh that he, Jeroboam, would be king. Yet as soon as he was firmly established as king, he set up the golden calves. Jeroboam was eager to tell his companions when he was anointed king, when they implied he was lying about what had been said to him. But by the time he truly became king, honesty was no longer important to Jeroboam I. Jeroboam I was afraid that if the people of the land continued going to the required feasts in Jerusalem, they would turn from him. He displayed no confidence at all in the Lord’s promise through Ahijah that he would be king. So he appealed to human laziness and lust. It is too much for you to go up to Jerusalem. False religion, apostasy, and rebellion against the Word of the Lord, are always the easy choices, at least at first. 500 years ago men and women prayed and searched the Scriptures for both the proper way to worship and the proper way to live their lives. Today, Christian churches have little or no emphasis on obeying the Word of God in lifestyle or worship. The message is on doing what is comfortable and easy to “grow” a big church. The next action Jeroboam I took was to place these idols at the borders of his kingdom for “ease of access.” This was in keeping with the rest of his policy of lies to make his false religion easier. None of this would have worked except for the removal from office of those who knew and understood the Law and replacing them with people willing to “go along” or “follow orders.” Of course this meant new houses of worship, all at the state’s expense. These new state schools became very effective indoctrination centers. And he made a house of high places, and made priests of the lowest of the people, who were not the sons of Levi. Once the entire false worship system was set up, false feasts, worship services, were set up to run counter the true worship of the Lord in Jerusalem. Americans have been assaulted by a variety of Jeroboam policies from the federal government for well over a hundred years. Since God poured out His Spirit to found the Church, we are the first generation to have the teachings of the Word of God in an electronic format. We have the responsibility to use this opportunity to pass on to the next generation what the Lord has given to us. These blessing and opportunities are also a great responsibility. Unlike the printed copies of educational material, educational ebooks can be given away for nothing more than the cost to store the material on a publisher’s site, which is at this time about two dollars per book. Then these books will be available worldwide to anyone who can read English and owns an ebook reader. At this time ebook readers are available in the US starting around $79. With very minimal advertising and no marketing, we have sold books in about twenty countries. While we do write fiction, our educational goals are to write an integrated series on the history of the world. The Introduction to the Conflict of the Ages Series is entitled Antidisestablishmentarianism. One of our reviewers wrote that it was 950 pages on his ebook reader, so we also made it available in 4 sections as 4 separate books, What is an Establishment of Religion?, What is Secular Humanism?, What is Science? and What are the Results of the Establishment of Secular Humanism? The Conflict of the Ages series begins with a defense of the origin of the universe in part one. Part two covers the origin of evil. At this time, part three, the flood and the ice age is about half complete. We intend to cover history through the twentieth century. At this time we estimate that will be about 42 volumes. We were surprised to discover that no other ebook is available with our perspective. We have two major differences from any other works that we are aware of. First, we hold to the Scriptures as absolute authority but use other sources. We hold that Josephus and other ancient sources, though they contain errors, are more reliable than physical evidence available today through science. The reason is that the cataclysmic changes, not just during the flood but for hundreds of years after, have made the proper interpretation of the physical evidence extremely difficult. Second, we integrate the history of the ancient world with art and literature. To the extent possible, we intend to include mathematical problems as well. With some people there might be one other issue. We have no intention of making a detailed scope and sequence with daily assignments, quizzes and tests. Though we include many questions in the teacher’s edition, these need to be modified by the parent or teacher to fit the needs of the students. While the basic text has vocabulary suitable for an advanced elementary level student, the concepts are difficult to grasp in places and the recommended outside reading ranges up to the postdoctorate level.